Get a Fast and Free Quote on Custom Bags and Totes for your Event or Business Today! We think you'll "totes" agree: Gallant Gifts is the place to "bag" a bargain on all your wholesale promotional items! 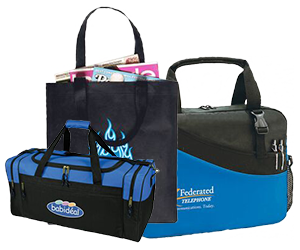 From grocery store totes to golf bags, our bag and tote collection offers so many great options for promoting your company. Use these custom promotional items to take your brand wherever you want it to go. Pack marketing collateral, create a swag bag of personalized promotional products, package branded merchandise for sale, and more. Our extensive collection of promotional bags and totes ranges from briefcases to backpacks, from computer bags to wine bags. Choose from a wide range of vibrant colors and durable materials, including plastic, and canvas bags. From eco-friendly recyclables to keepsake collectibles, these wholesale promotional items Let Gallant Gifts add your company logo or other custom details. Now everything you need for the best brand promotion is "in the bag"!